It's finally Friday! This weekend is our last full weekend in the city, so I'm pretty excited to go into "tourist" mode and explore, eat, shop, take pictures and just enjoy this city that we've been lucky enough to call home for the last 7 years. The forecast is looking pretty favorable for a weekend of adventures. In fact, it looks like the summer weather is still going strong, and I couldn't be happier about that. It appears my plan to go from summer here straight to summer on the west coast is working out quite nicely. I have definitely been thinking of fall clothing, outfits and pieces I want to buy, but for me, when the weather continues to be warm and sunny, it's a struggle to not continue dressing for summer. Case in point, anything linen. I adore light and breezy linen pieces and would live my summers in only them if I could. I know people certainly don't follow fashion "rules" the way they used to, but linen is still only primarily worn during the warmer months. Leave it to me to break the rules and wear it whenever I choose (mostly because I just love linen that much). This white linen dress is another piece from the same brand that sent over the sweater I featured in this post. Just like the sweater, I knew when I saw this dress that it would be perfect for Maine, and I was not wrong. I wore it while we lounged and read on the back porch, arranged fresh flowers and cooked a lobster dinner. It's comfortable, breezy, light and easy to move in. 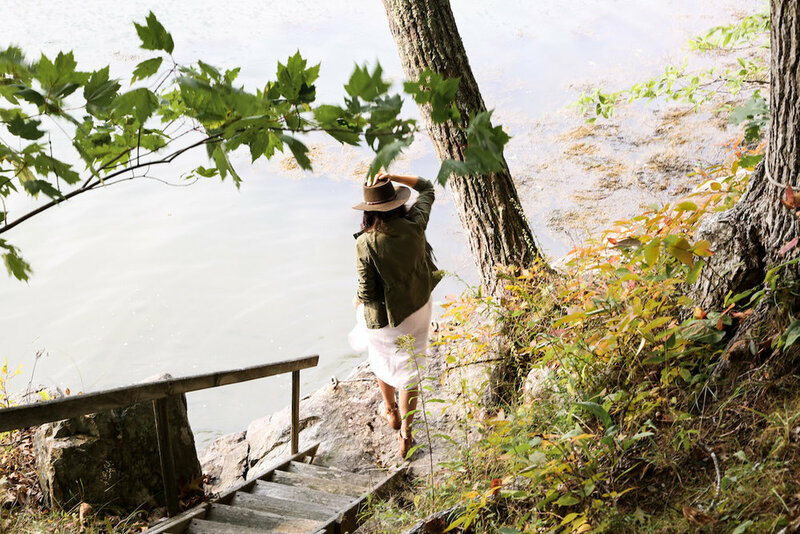 While New York's summer is still going strong, Maine was already well on their way to fall, so it was the perfect opportunity for a little seasonal transitional dressing, aka styling this linen dress for fall. It was fine as is while we were at home, but stepping outside to go explore required me to add just a few things to make the dress a little more appropriate for the cooler fall-like temps. I'm sure you're thinking "Duh! Adding a jacket and a hat are a no-brainer way to transition a light summer piece into a warm fall outfit!" and you are not wrong. But it's all in the details. For example, if I had used a denim jacket instead of this forest green utility jacket, the outfit would have still had a more summery vibe. Wearing a straw hat, as opposed to this wool gem I found at a vintage market in Camden, again, would have left the outfit feeling more summery than fall. And while I still wore sandals, I chose ones in a neutral/fall palette (a golden brown hue), to again, give a more overall fall feel to the outfit. Of course, this ins't completely necessary, but I also chose to keep my makeup more warm and bronze-y, as opposed to light and bright, to, again, help with the overall fall look I was going for. DO YOU HAVE ANY FAVORITE PIECES THAT HELP YOU TAKE YOUR SUMMER CLOTHES INTO FALL? I KNOW THIS JACKET IS DEFINITELY GOING TO BE A FAVORITE TRANSITIONAL PIECE FOR ME!